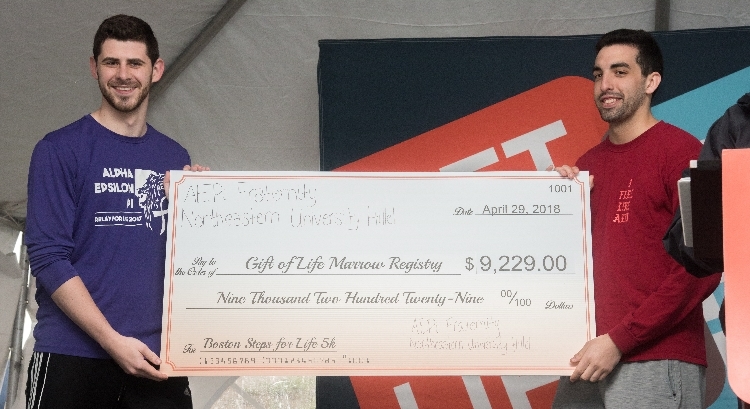 Gift of Life held the 4th annual Boston Steps for Life 5k on Sunday, April 29, 2018 at Chestnut Hill Reservoir in Brighton, Mass. For two special people arriving at the event, this would be one of the most exciting days of their lives. Just over a year ago, Sonoma, Calif. resident David Llodra (pictured above, right) was in a fight for his life, but now he was ready to meet the attorney from New Jersey whose generosity had saved him. David, 51, originally from Spain, works in research and development in the wine and spirits industry, and is the father of three. David saw a doctor to ask about cysts that were slow to heal, and a blood test revealed he was suffering from acute myeloid leukemia. David had trouble believing the diagnosis as he felt healthy, but once it was confirmed he was happy to learn that a stem cell transplant offered the hope of a cure. He was fortunate that Gift of Life quickly found his matching donor in its registry. That blood stem cell donor was New Jersey resident Avi Guttman, a 29-year-old attorney and father of two young children. The two were introduced by Gift of Life Chairman Bill Begal. When Avi came forward to meet David, the two hugged as if they had always known each other. Avi had joined Gift of Life’s registry while a student at Yeshiva University in 2007. Anna Rubin (c), Stem Cell Transplantation Coordinator at Dana-Farber Cancer Institute recognized the many donors and recipients attending the event. Dana-Farber is a Gift of Life collection center, and their runners are regular participants at the 5k. 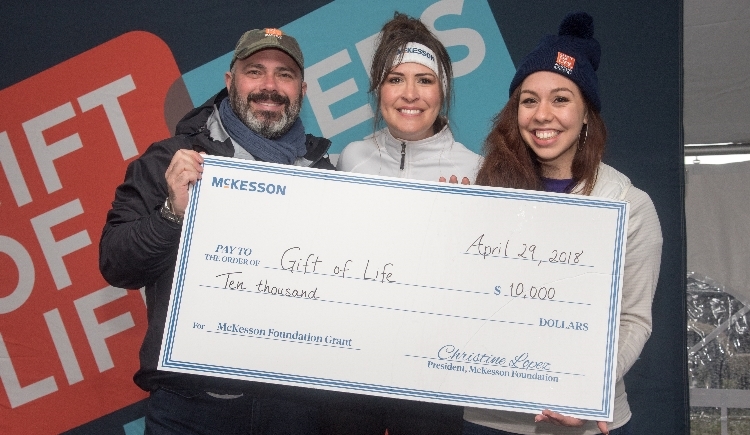 Emily Seidel (c), Manager of Community Engagement with McKesson Corporation, along with her colleague Jazzy Reuben (r), presented Gift of Life Chairman Bill Begal with a check for $10,000. 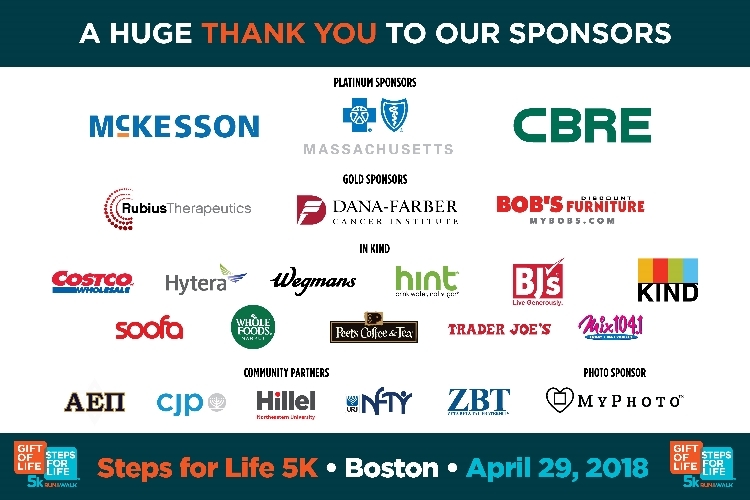 McKesson is a corporate partner, serving as platinum sponsor for the Steps for Life 5k of Boston since the event’s inception. This year their incredible team of 104 runners and walkers raised $5,200 to sponsor new donors joining the registry. McKesson encourages employees to join the registry via an online portal and during their annual employee health screenings. As a result, more than 5,100 donors have joined the registry, resulting in one lifesaving transplant to date. For the second year in a row, the Northeastern University Alpha Epsilon Pi Fraternity and the Hillel chapters teamed up to hold a charity river cruise in Boston Harbor, with ticket sales benefiting Gift of Life. Ben Yarski (l) and Adam Markin (r), Philanthropy Chairs of the Sigma Kappa Psi Chapter, presented a check for $9,229 to Gift of Life. 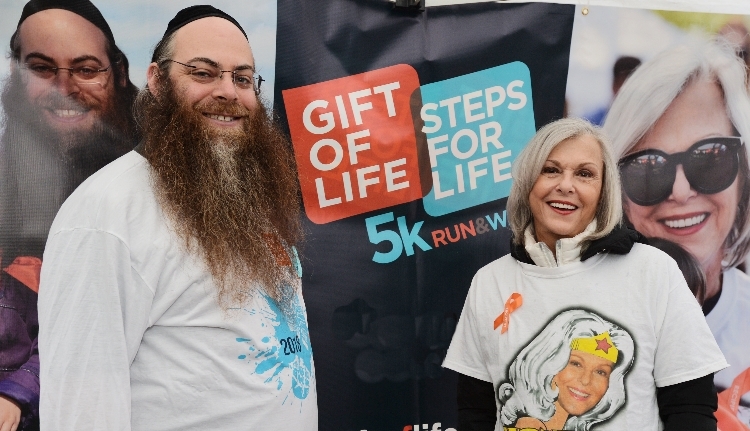 NBC10 Boston television anchor Phil Lipof served as the Steps for Life emcee for the past four years, and the station covered the event during their news broadcast. Sophie and Jacob Margolis sang the National Anthem. To kick off the race, a large contingent of amazing superheroes, all aged 6 years and under, lined up to run the Superhero Sprint. 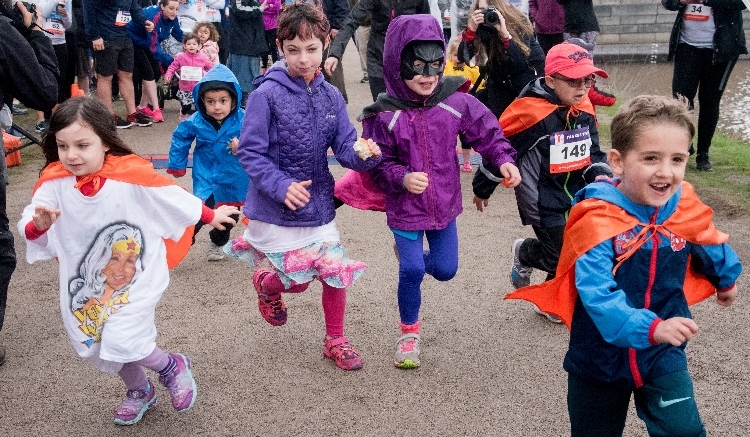 Gift of Life’s littlest heroes received bright orange capes and were awarded medals for completing the 50-yard dash. Gift of Life’s Grand Marshals for the race, 23-year-old donor Kayla Hammergren and her 7-year-old marrow recipient James Strejc led off the 5k. 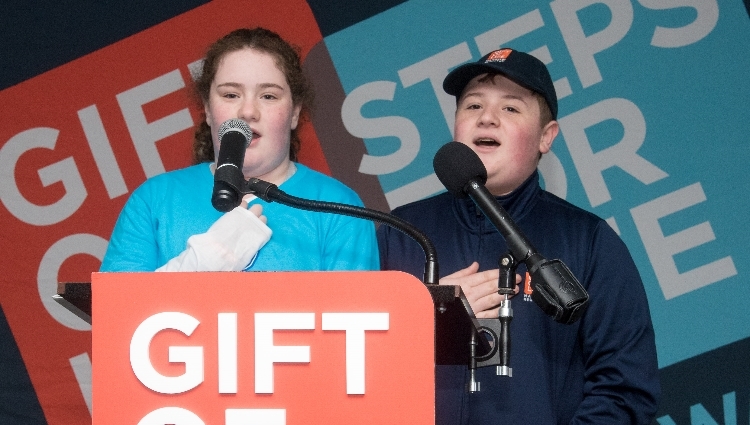 Kayla and James were introduced at the first Steps for Life of Boston in 2015. The top male finishers were Tim Malloy, 51, Tyler Bean, 24, and Michael Sage 27. Top female finishers were Jordan Smelker, 25, Maegan Hoover, 31, and Gift of Life donor, Laura Pacheco, 24. Full results are available at the Cool Running website. Lynne Goodman and Team Lynne were the top fundraisers for the second year in a row. Lynne is a courageous transplant recipient and cancer survivor, who was joined at the event by her donor, Natan. Gift of Life thanks our generous platinum sponsors, McKesson, Blue Cross Blue Shield of Massachusetts and CBRE, and our gold sponsors, Dana-Farber Cancer Institute, Rubius Therapeutics and Bob’s Discount Furniture. 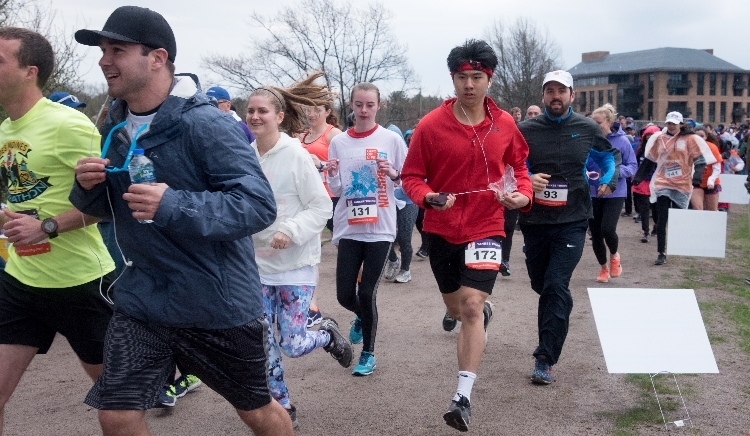 The Steps for Life 5k of Boston will be held again in spring 2019. Visit www.giftoflife.org/stepsforlife for the date announcement, or join our mailing list to receive advance notice.